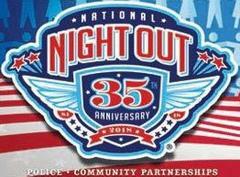 National Night Out is less than two weeks away, are you ready? Tuesday October 2nd is less than two weeks away, are you ready? We encourage everyone to turn on their porch light, lock their doors and get out to meet your neighbors. No matter how big or how small your gathering is, we want to know about it. The Police Department will be out in force with goodies for the kids, you may even get a visit from the Mayor or the Chief of Police. We have a limited number of NNO t-shirts available for our party organizers. If you have not already, contact Lieutenant Cassidy at mcassidy@cityofsachse.com to get a party application. This is always our favorite time of year, when we get to get out and be face to face with our citizens.